What does the Chassis Height Measuring System (CHMS) come with? Each system comes with: 4 sensors, 1 tablet, 1 wall power cube, 1 charging cord in a custom carrying case. The sprint car package comes with magnetic floors and torsion bar mounts or round tubing mounts. How to use the sensor? How to get everything connected? Now you can make adjustments on the car. 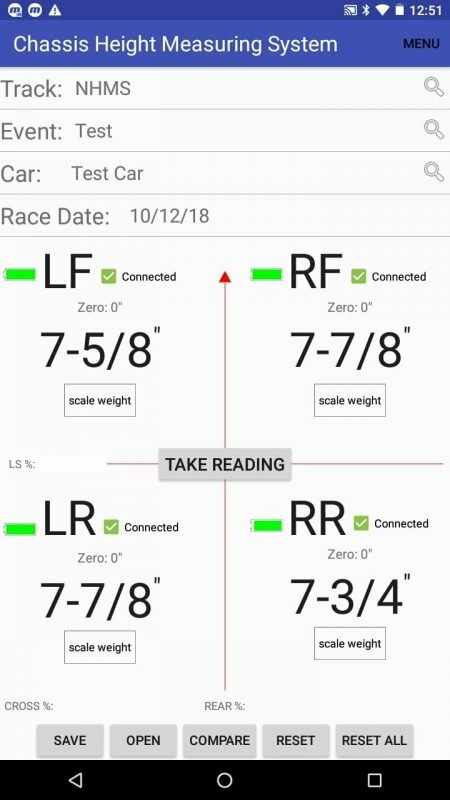 Take a reading to show the chassis height changes. Level your scales to each other and each side to side and front to back. *This is a very important step and imperative for accurate and repeatable results. Place all sensors on the ground positioned where you want to take height readings. On tablet, push save zeros and name it and push okay.